Scale calibration 0 - 4000 r.p.m. High degree of accuracy, reliable, smart illumination, double glazed. Supplied with white and chrome finish bezels. Scale calibration 0 - 4000 r.p.m. High degree of accuracy, reliable, smart illumination, double glazed. Supplied with black and chrome finish bezels. Our Pro Series II Analog Tachometer features built-in oil and temperature warning lights. Accurate digital information is presented in a clean, easy-to-read gauge for instant, reliable information at a glance. Combined with additional sensors, Mercury’s digital gauges are powerful tools to provide safety and comfort while on the water. A boat tachometer indicates the engine's rotational speed in revolutions per minute. Those offered on NauticExpo are intended for leisure craft. These instruments are nearly indispensable on all motor vessels and sailboats with auxiliary engines in order to avoid engine strain or overheating, and to manage fuel consumption. A sensor, usually linked to the alternator, measures engine revolutions per minute (rpm). The reading is indicated by a needle on an analog dial or on a digital display. 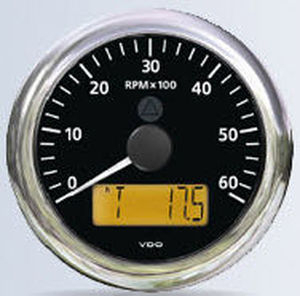 In general, the dial markings are in hundreds of rpm (e.g., 20 = 2000 rpm). This reading allows the helmsman to keep the motor at its most efficient operating speed, avoiding excess fuel consumption and accelerated wear. Some tachometers also display the total running time of the engine in hours. Choice will depend on compatibility between the instrument and the engine. The inclusion of an hour meter is a practical advantage. Matching the tachometer to instruments already installed in the panel also should be considered.